Whether your holiday style is of the culinary, family or hair-raising kind, it’s time to say ‘yes’ and take off on a new adventure with Oaks Hotels & Resorts, with savings of up to 30% available across a number of city and seaside properties when you stay for two nights or more between now and 30 September 2018. Splash into Oaks Oasis Resort on the Sunshine Coast for an epic family adventure – from swimming, sliding, jumping, putting and climbing, young travellers will have no shortage of activities to get involved in, while parents kick back with an icy cold beverage and soak up the Queensland sunshine. From just $113* per night, families can retreat to a coastal-inspired Executive Family room at Oaks Oasis Resort and save 30% when staying for three nights or more and using promo code MYOAKS. 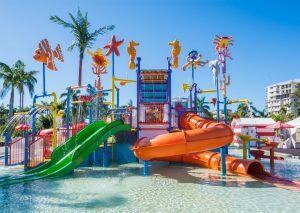 Guests will also receive free Wi-Fi, kids eat free incentives, plus an early check in and late checkout. And the family-friendly adventures don’t end at the Resort – jump in the car and make a b-line to Australia Zoo, take to the water and master the art of SUPing, or head for the hinterland and explore magical Maleny. 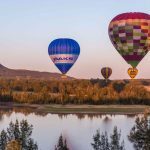 If your idea of an adventure involves golfing, ballooning, pampering, wine tasting and fine dining, Oaks Cypress Lakes Resort in the Hunter Valley may just be what you’ve been looking for. Nestled in the heart of this picturesque wine country, travellers can soak up the serene surrounds from a spacious and self-contained Two Bedroom Villa from just $262* per night, with savings of up to 25% on offer when booking for a minimum of two nights and using promo code MYOAKS. A bonus early check in and late checkout, and free Wi-Fi are also included in the deal. Take to the skies aboard Oaks’ very own hot air balloon; please your palette with a winery tour; sample the finest local produce at award-winning restaurants; or swing into a round of golf at the Resort’s championship 18-hole golf course. 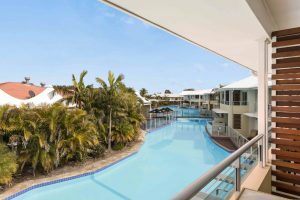 Fancy a sun-soaked escape to the seaside township of Port Stephens? Book your two night adventure at Oaks Pacific Blue Resort and save up to 25% when using promo code MYOAKS, and you’ll enjoy free internet, kids eat free incentives, a 12pm early check in and 11am late check out. Rates start from $126* per night for a Hotel Room, or $150* per night for a One Bedroom Lagoon. Set the adventure-meter to high and get amongst the region’s most popular activities and experiences, like sand tobogganing, quad-biking, or camel riding along the shoreline; and then cool down with a dip in Australia’s largest swimming pool – measuring in at a whopping 500m long. *Terms and conditions apply; subject to availability; minimum two/three night stay. Un-serviced rate only. Book before 30 April and travel until 30 September; certain blackout dates apply for each property.